A while back I enjoyed Dolmio Pasta Vita, Sweet Pepper Flavour. 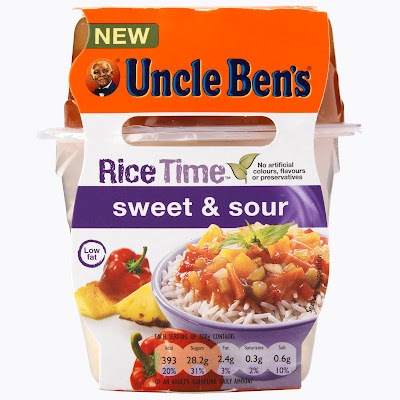 I remember how filling and tasty the meal was, so I was looking forward to trying this Uncle Ben’s Rice Time Sweet and Sour flavour. Like the Dolmio Pasta Vita before, I peeled back both lids a little, heated both at the same time for one and a half minutes in an 800 watt microwave, and poured the smaller pot’s contents into the larger pot. There was plenty of Chinese sweet and sour sauce, which mixed in with the Uncle Ben’s long grain rice easily. With no artificial colours or preservatives, the sauce consisted of sun ripened tomatoes, pineapple, onions, green and red peppers, and carrots. I ate the sweet and sour rice meal with Sharwoods Chinese style prawn crackers in a bowl on the side. During lunch I watched a very tense episode of Magnum where he was trying to catch a psychopathic prostitute killer. The Psycho Nutjob kept phoning Magnum and taunting him with too much knowledge of the Private Investigator’s Vietnam War years. Whilst I watched the thrilling episode I found this ready meal had a sumptuously tangy and authentic tasting Chinese sweet and sour sauce. The large pot’s contents just tasted great and went perfectly with prawn crackers and a pint of beer. It was definitely a very tasty and filling lunch for one. I would definitely have this meal again, for either lunch or dinner. The prawn crackers would be mandatory, of course, but maybe next time I’ll wash it down with some sake instead of beer. From the quality of the last two ready meals, I’d like to see some more in this range, perhaps a black bean sauce flavour or a nice tasty curry to complete the irony for Little and Large’s sake? Rogan Josh anyone? My teenage son would live off the Sweet & Sour variety if he could!